This page will tell you something about the tricycle conversion. During the last 100 or so years there have been some tricycles produced with two wheels at the front - a layout sometimes called "tadpole" and sometimes incorrectly called a "Kendrick" after a notable maker in the early 20th century; their lack of success probably owes more to the development of a suitable differential axle and to poorly designed steering than to anything else. The Newton conversion uses an Ackermann-type steering, just like a car, and, while steering and riding any trike takes a little time to get used to, the steering of the Newton is extremely good and the handling is better than most "conventional" trikes. There are three main advantages in the "2-front-wheels" layout - firstly, the drive is applied to the centre-line of the machine, which is not the case with many cheaper conventional trikes using single-wheel drive, additionally, any conventional cycle transmission can be used. The second advantage is in weight distribution, firstly the weight on the driving wheel is increased, giving better traction, and secondly weight transfer when cornering is much easier - if the inside wheel starts to lift on a corner, you simply lean your weight onto the inside handlebar. A related issue is that if the machine lifts a wheel, it tilts diagonally towards the rear, whereas a conventional trike tilts towards the front - since generally you are going forwards, your momentum makes the conventional machine more likely to overturn. Finally, the braking is far superior, now using mechanical disc brakes as standard on both front wheels, giving much greater safety - by contrast, many cheaper "conventional" trikes only brake one of their back wheels, some even have 2 brakes fitted to the front wheel and none on the rear! The main tubes of the conversion are high quality cycle tubing from (among others) Reynolds and Columbus, bronze welded. The conversion is designed to fit a standard frame 21" (53cm) or over in size, and using wheels in the range from 24" to 27", including ATB sizes. It fits onto the bicycle by removing the complete front fork assembly and attaches by means of a clamp at the head tube and another at the bottom bracket. The conversion set weighs around 8.7 Kg, whereas a typical front fork, wheel and brake assembly weighs around 3 Kg, so the increase in weight over a standard bike is about 5½ Kg or 12 lbs. The front wheel track is about 27" (68cm), and the overall width is about 33" (84cm) when travelling in a straight line. The complete machine can be got through a doorway as narrow as 29" (74cm) by turning the front wheels. For this conversion, which is also available for aluminium frames, we prefer to have the frame here to ensure a good fit. We can also offer a permanent conversion welded on to your bike frame, which is neater, stronger and slightly lighter - of course, to do this, we have to have the cycle frame here. 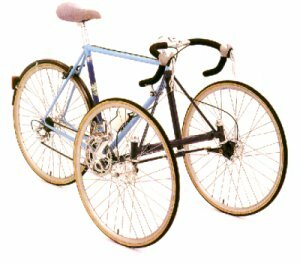 We can't guarantee to match original paint finishes or to preserve original logos on the frame. We can't offer a welded conversion on aluminum frames. Delivery should take about 6 weeks from order, but please contact us for the latest situation as there is sometimes a waiting list. The price in standard form is UK£1400·00. 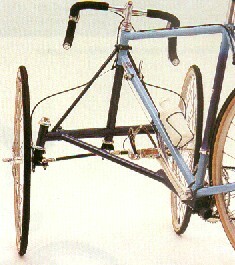 A tandem version is also available.